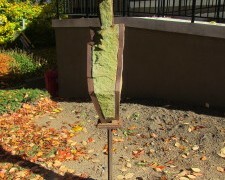 “Stone sculpture allows me to speak in a universal language. 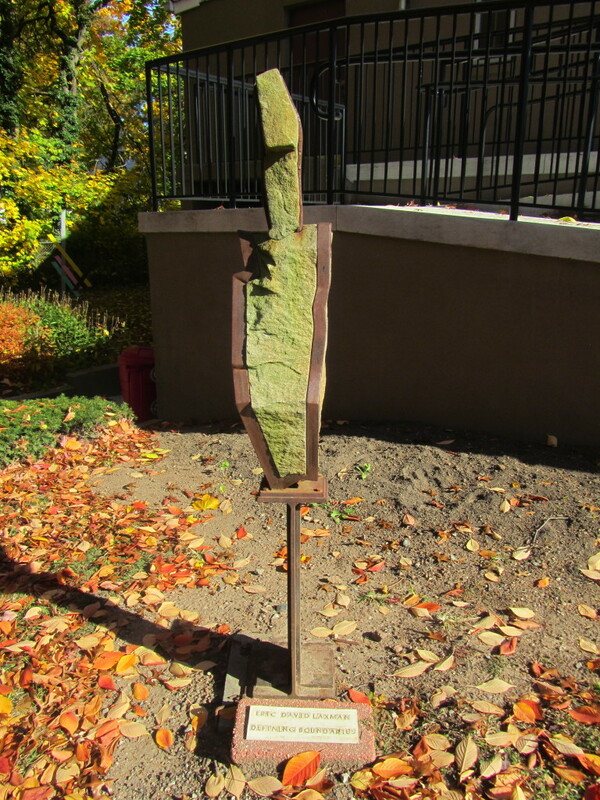 Creating a stone representation of an idea, a concept, or a feeling for the viewer to interpret through their own experiences begins the unspoken dialog. Stone is my choice of medium because it is perceived as a hard, cold, and unfeeling material. But when stone is presented as a soft or complicated shape, a person will react with amusement and amazement that opens their mind to new possibilities and prompts them to reexamine their views on the broader subject matter. 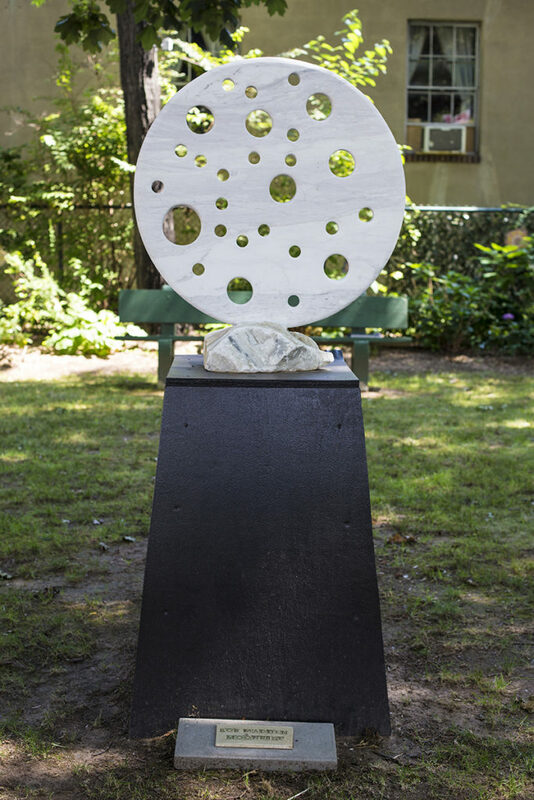 Generally my work will alternate between two major themes; works which explore our place in the universe, concepts of space, time, destiny, and chance, and the second major theme of interpersonal relationships and the connections that bind people together. Keeping in mind the quote from Socrates, “The unexamined life is not worth living”, I strive to develop works which ask the viewer to look beyond themselves and see how they relate to the rest of humanity and where they fit in a larger universe. The underlying tone of any specific work may be designed to provoke amusement or serious reflection, but it’s during those moments that the mind opens up to new perspectives. This is the objective of my work. For more information, please visit rockandasoftplace.com. 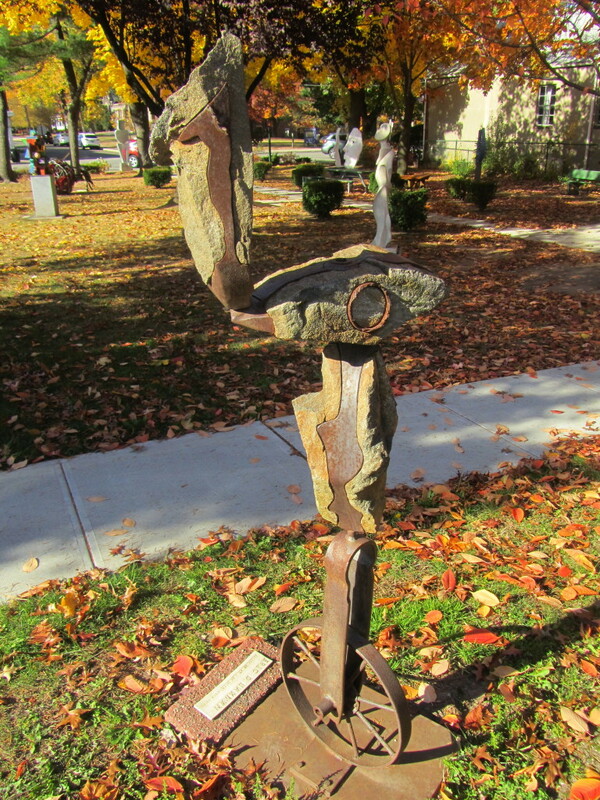 This sculpture was located on Broad Ave in front of the Leonia Elementary School. 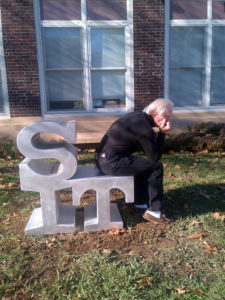 Artist statement; “Well, yes it’s a chair. What did you think it was? Often we think art is arcane. Sometimes it’s just as literal as the nose on your face. I spend most of my time as an artist solving problems. It’s like Jeopardy. The artwork is the answer to a question. Usually a question I have posed then answered. This time the question was to interpret a chair. Since we have become such a verbal species, language is integral to how we define and explain the world around us. So while you enjoy your surroundings, sit, assis. Seriously, try it out, take a selfie. My art is first informed by the humanfigure, its essential vertical presentation with a focus on unique but relatedfrontal and rear views, and the gestalt of interconnected shapes that are bothlinear and volumetric. It is secondarily informed by totem poles of the NativeAmericans of the Pacific Northwest and other tribal cultures from around theworld, with their stacked and interconnected elements that may represent keyfigures or concepts in their myths and legends, combined to “tell a tale” orremind of basic cultural tenets. Though my sculptures do not represent anyspecific events, I imagine my pieces as abstract tales both of personal eventsor generally themes of human experience. 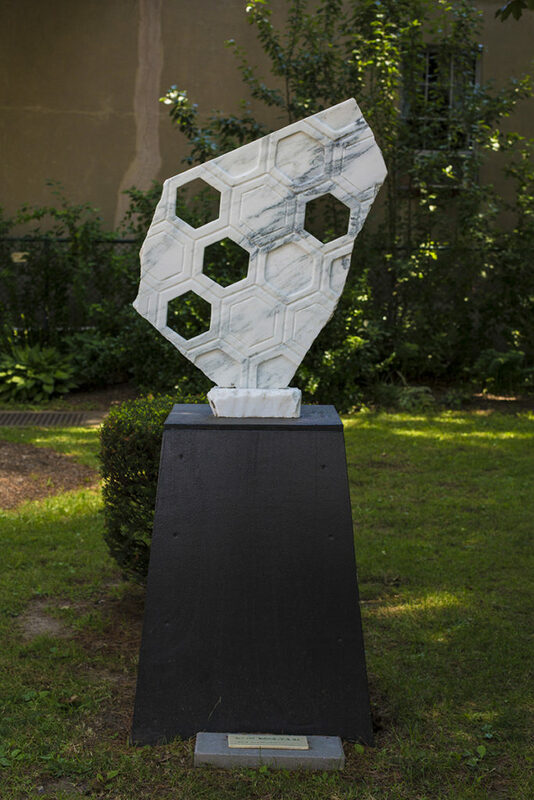 The pieces develop from gesturalsketches based on this visual language of interconnected forms merging anddiverging usually along a vertical axis. Most recently I have worked in forgedsteel which has fostered new gestural elements that this material inspires. The split wood and steel sculpture by artist and composer, MICHAEL POAST, is a manifestation that relates to his musical composition written and performed with the InterMedia Ensemble at Saint Peter’s Church at Citicorp Center, NYC, in 2013. Lumen De Lumine, meaning “Light of Light”, is part of the Credo section of the Latin text that Poast used to compose his Color Music Mass. Being sculpted at the same time, splitting wood planks with a sledge hammer and thrusting them ,one after the other, into the vertical steel tube, that forms the lower section of the sculpture, it was as if the split wood, the action of the splitting, if one could equate it with the splitting of the atom, released a bright light, an expansion of energy. The addition of the curved angle bars of steel, signifying this expansion, became the physical reality of this radiating light. 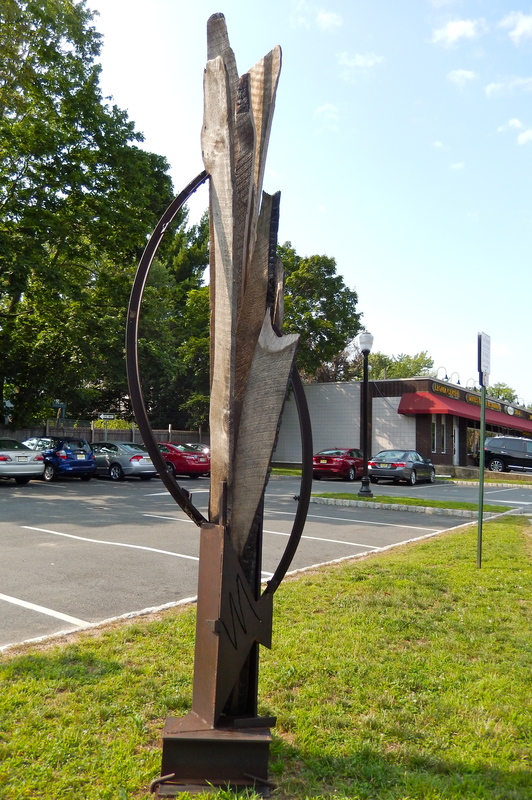 Lumen De Lumine, incorporating steel and charred split wood, is part of a series of sculptures using these materials exclusively. 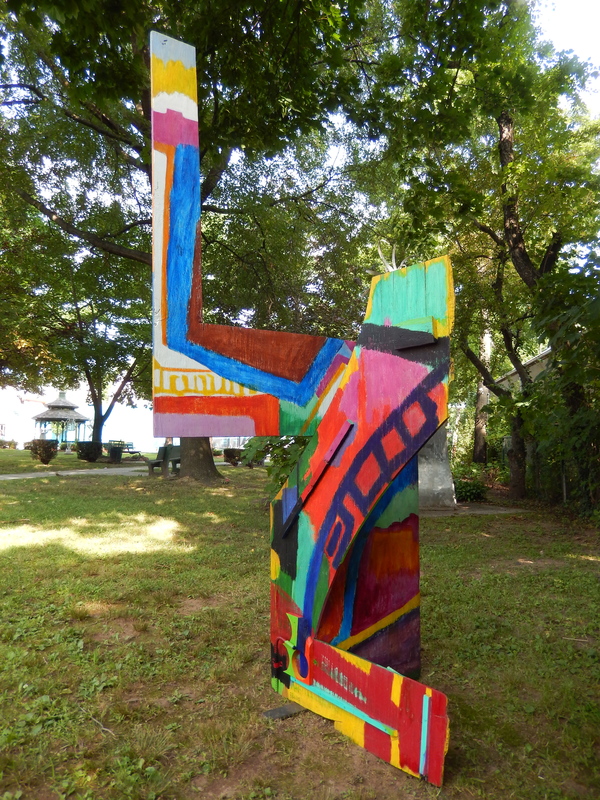 A large installation, Fence Sonata (2014), newly re-composed for the Unison Art Center in New Paltz, NY, incorporates these same materials, while also using the 4th dimensional quality of brilliant color as spatial exploration. 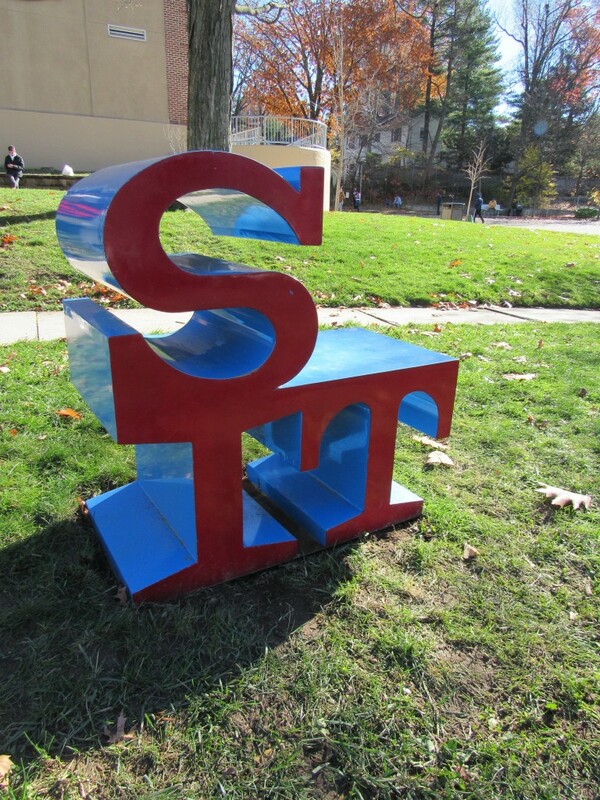 MICHAEL POAST is on faculty of St. John’s University and Pratt Institute, where he had a solo exhibition of his Color Music Manuscripts in March 2014. 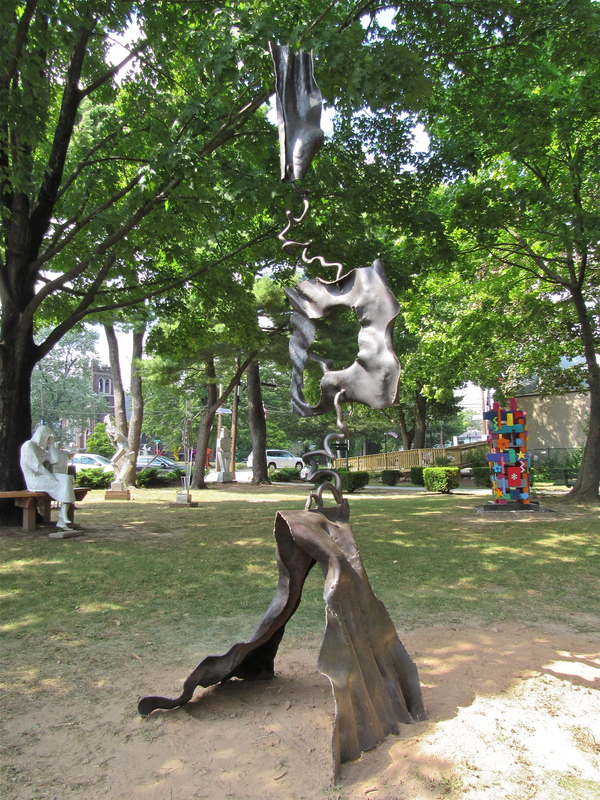 Water Music, a large steel sculpture installed on the waterfront boardwalk in Yonkers, NY; the Unison Art Centers installation, Fence Sonata; and his piece, Atlas, that will be re-sited in Beacon, NY, are among his most recent projects. “That’s the way it’s put together, flat planes leaning against each other, stable and yet not.” A metaphor for our lives, these painted wooden boards, cut into sweeping and angular shapes, lean and support each other into an interlocked form, stabilizing the other, yet acting in contrast. The brightly painted surfaces reach out towards the viewer, forms interacting with space, interacting with color. HOUSE of CARDS appears as an architectural structure until the viewer engages more closely, in which the solid shapes become more directional and vivid, painted, brushstrokes of color command the attention of space. The artist, Beth Bailis, a native New Yorker, who lives and maintains a studio in Long island City, Queens, graduated from Maryland institute College of Art, and when returning to NYC, received an MFA from City College, CUNY. Primarily a painter, her work spans from landscape to abstracted compositions to mixed media configurations, entitled Fusion Paintings. Bailis is also a muralist, her most recent public mural is installed in the Roosevelt Island Motorgate Parking Garage in the entrance Atrium. 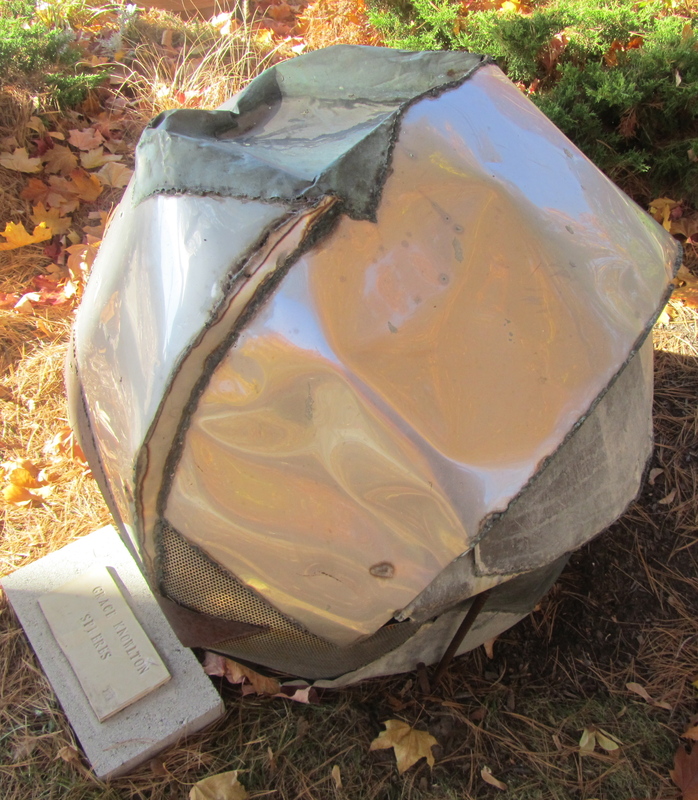 Described by well known artist, Al Loving, whom Beth studied with, as “material madness”, her Fusion Relief Sculpture can be viewed currently at Unison Sculpture Garden in New Paltz, NY. 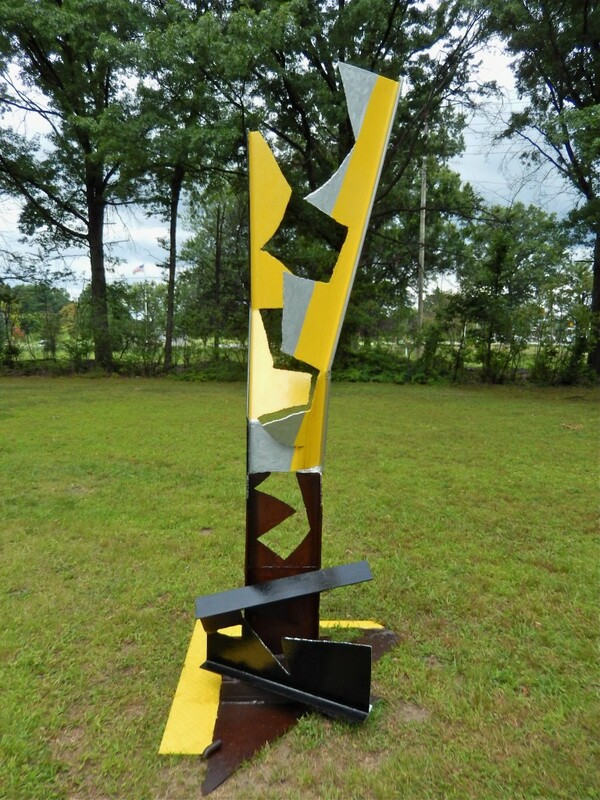 This piece, HOUSE of CARDS, has been exhibited at BWAC ( Brooklyn Waterfront Artists Coalition), annual sculpture show at Brooklyn Bridge Park in Dumbo, Saunders Farm Annual Sculpture exhibition with Collaborative Concepts in Garrison, NY, and Metalmen Sales in Long Island City, Queens, along with other Fusion works by the artist. 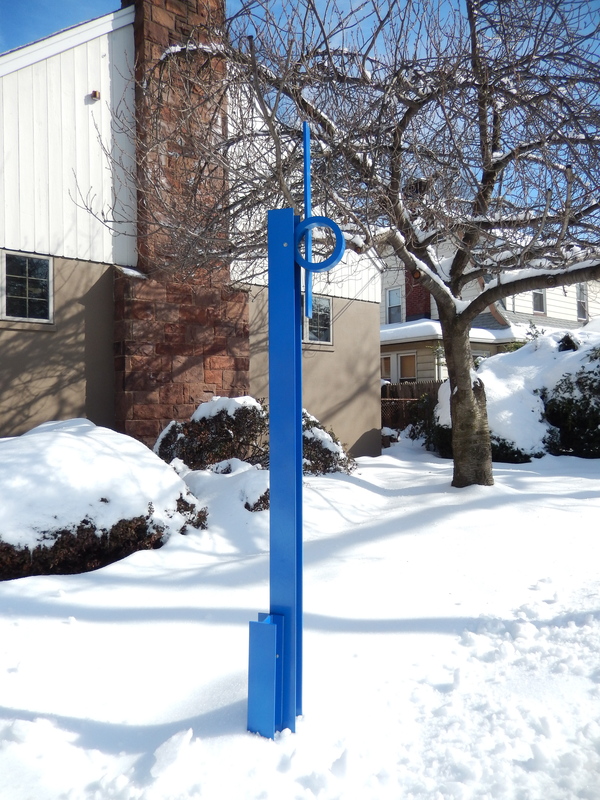 Bailis’ art can be seen in the permanent collections of the City College Art Collection, William Whipple Museum at Minnesota State University, Wilson College, Chambersburg, PA, and long term loan at LaGuardia Community College, LIC, NYC. Don started figurative sculpting as a young man, then worked as a clinical psychologist. When he got back to his art it evolved from figurative to abstract. Breaking free of true anatomy was liberating. 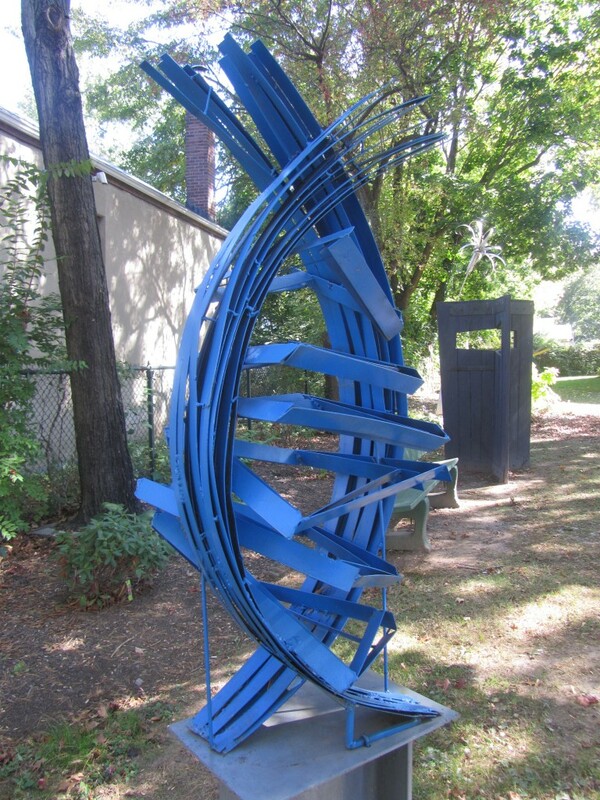 This piece is powder coated steel, sprayed in a rich blue color to enhance the form.